This weekend was the Summer Solstice, marking the first day of summer. I always like to have friends over as it is (1) the anniversary of when we moved into this house and (2) how could you not want to celebrate summer! And I think a wonderful way to welcome summer via cocktail is a Pimm’s Cup. A Pimm’s what, you say? Yes, I thought so, too. I was introduced to this delicious summery drink by my English friend, Sarah. The cocktail includes a liqueur popular in England but not as much in the U.S. That’s because I didn’t know about it until a few years ago. Now everyone will know about it, right?! 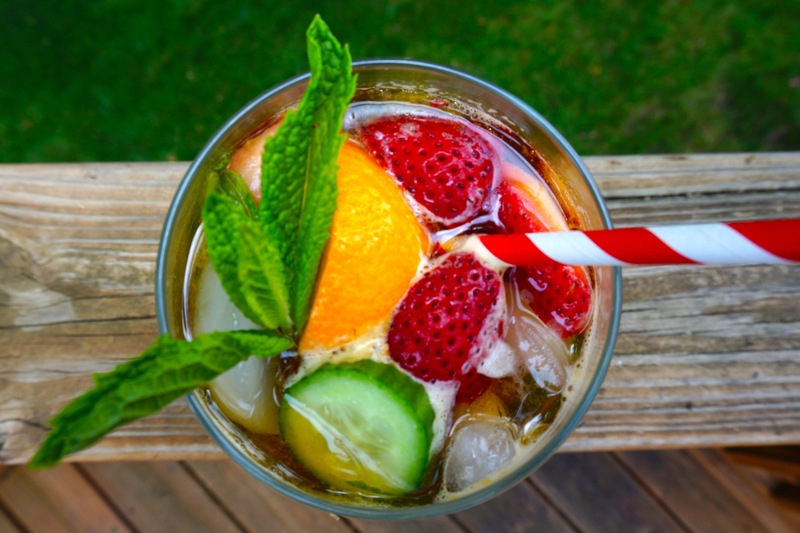 Pimm’s is a gin-based drink containing a “secret mixture of herbs and liqueurs”, first created by James Pimm in 1823. Pimm served it in a small mug known as a “No. 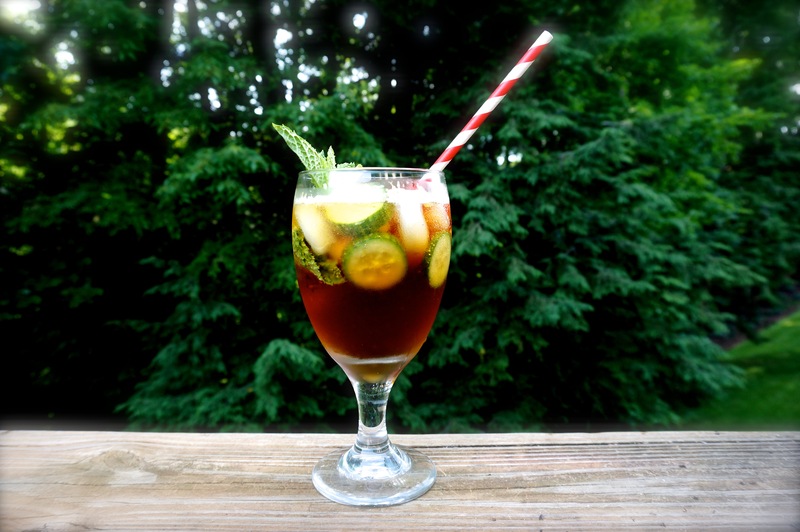 1 Cup”, hence the full name – Pimm’s No. 1 Cup. Pimm’s makes other brands based on other spirits – No. 2 Cup is Scotch whiskey, No. 3 Cup was brandy, etc. But Pimm’s No. 1 Cup is what we want to use for our fun-time summertime drink. It is dark in color, looks a little like tea, and tastes like a combo of citrus and spices. Now I’ve had a so-called Pimm’s Cup in a few establishments and it just cannot compare to Sarah’s recipe. That’s why it’s best made at home. You can make a single drink or a pitcher for a party. Either way it will be delicious and I guarantee the World’s Greatest Pimm’s Cup! First we need our accoutrements (fancy French word I like to use for “stuff we want to put in this drink”). I’m sure you could try different fruits and herbs, but she introduced it this way, so I like it this way – with strawberries, oranges, cucumbers, and fresh mint. Next we need the mixing liquid to add to the Pimm’s. Sarah uses Sprite or 7-Up (or any carbonated lemon-lime beverage, really – p.s. I tried this with Squirt and it was also delicious). FYI, the English call lemon-lime soda “lemonade” so don’t be confused if you order it there. In the U.S. we have our own variation of lemonade – it’s usually water, lemons, sugar (no carbonation) which I don’t think would taste as good. Also, some don’t like the sweetness that lemon-lime soda provides and opt to use tonic or club soda. I likah the sweet. I have not tried a “Pimm’s Royal Cup”, which I believe is a variation using champagne (oohlala!). Now we are ready to mix. Cutup the fixin’s (ok now I’m from the South!) and add to the glass of choice, which I think should be a nice-sized stemmed or stemless goblet. Muddle the fruit a little with a spoon and add some ice. 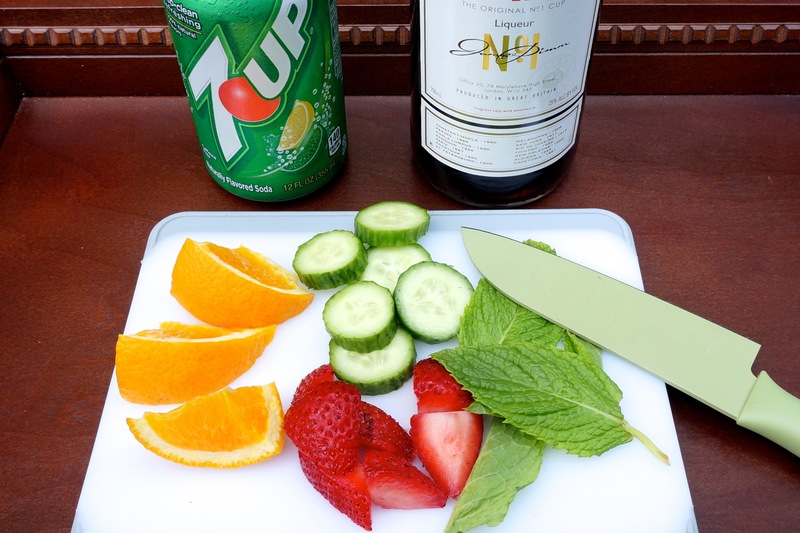 Pour in 1/3 Pimm’s to 2/3 7-Up. Stir a little and serve! Et voila or Cheerio Cheers, I guess I should say to be a little more English?! (p.s. I don’t think they really say that, it just sounds fun with the accent). Ooh, and you know what’s really fun is to serve this on July 4 in America. Boldly declare your independence from the crown but your dependence on their liqueur. Viva la Brittania! Ok, I’ll stop mixing French and English now. 🙂 Enjoy! This sounds très délicieux! Or…blimey, jolly good drink luv! (One must change accents for each comment.) I always think I want a Pimm’s because it looks so yummy, but never quite enjoyed it when ordered abroad (not in England). I will try this recipe as I think it will be a perfect, refreshing drink for the tropics. Thanks for sharing! Pimm’s Cup, which I’ve never had, might be my first drink after baby!